Well presented in an authentic style box using some artwork of the day. Hand sterling silver finish. 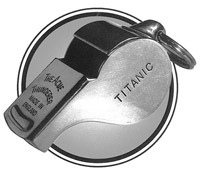 This authentic Titanic Mates Whistle is as supplied to the White Star Line for use on the Titanic in 1912 using the original tooling, and is supplied with certificate of authenticity. Comes in a presentation box.